EURUSD is consolidating after hitting low of 1.13011. The pair recovered till 1.14069 and started to decline from that level. 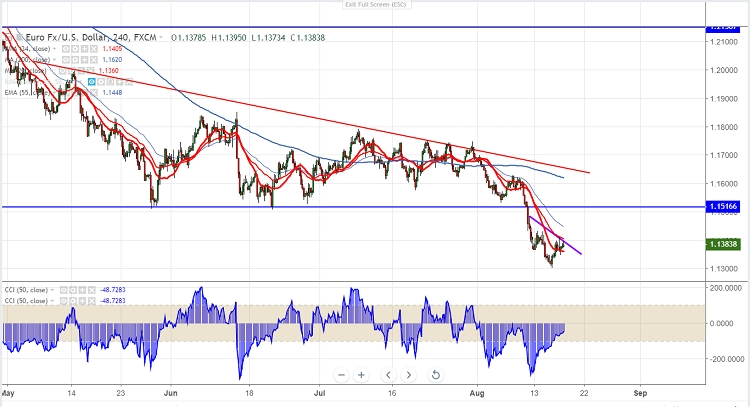 Euro’s decline was slightly halted as trade war tension between US and China eases. US and China is planning to have talks by end of third week of Aug.
Eurozone headline inflation came in line with expectations. It came at 2.1% in Jul and final core CPI came at 1.1%. The near term resistance is around 1.14070 (5 day MA) and any break above targets 1.1430/1.1465 (7- day MA)/1.1500. The near term major support is around 1.1300 and any break below targets 1.1250/1.1200. It is good to buy above 1.13950 with SL around 1.1350 for the TP of 1.1500.